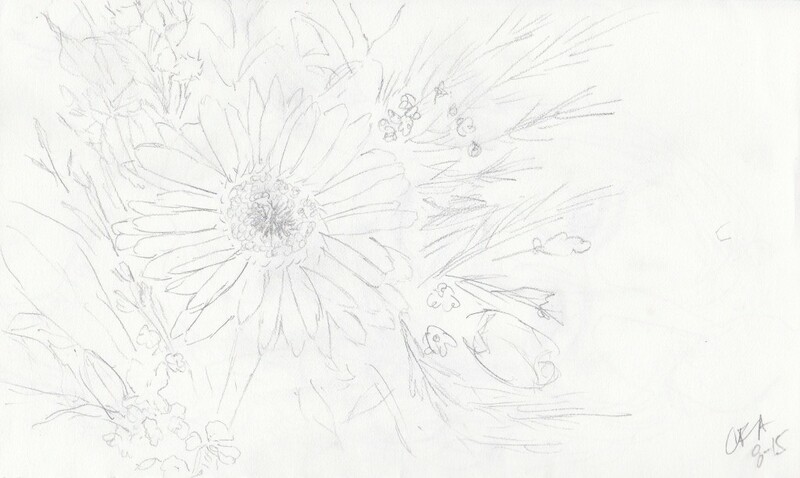 A quick sketch of a bouquet of daises. One of the challenges of daises is getting the petals aligned symmetrically around the center in a fashion that looks natural and balanced. 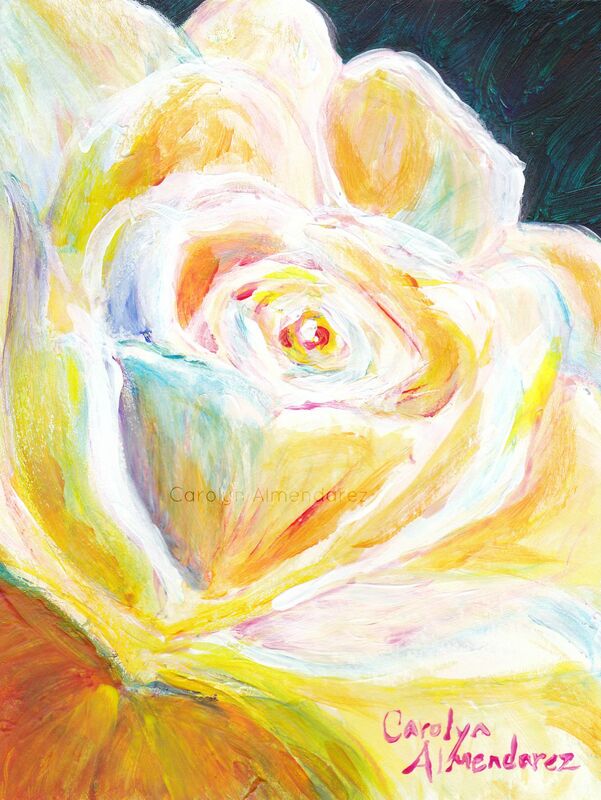 A colorful acrylic painting of a white rose in bloom. White flowers are one of my favorites to paint because white contains the full spectrum of color giving freedom to use all the colors of the rainbow to reflect the light, depth, and dimension captured within a white flower. Yellow Tulips by Carolyn Almendarez. 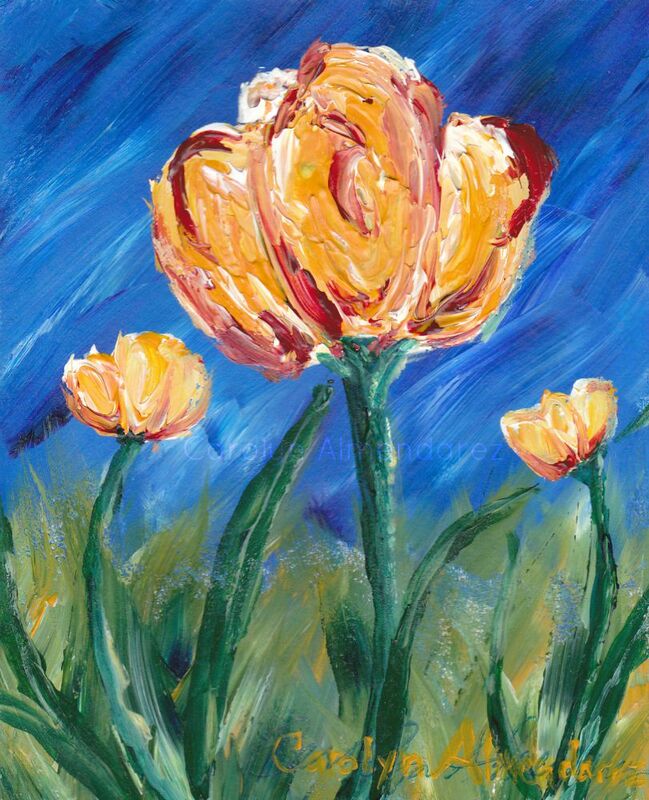 Acrylic painting of yellow tulips with red and white highlights on a windy day. After several sad looking attempts at following a tulip tutorial, I followed my own instinct and created these lovely tulips. I find that I create better when I trust my own intuition and pull from my own memory and experiences. Watching tutorials and learning from other artists can help to build skills, artistic concepts, and techniques. But the truest art comes from the soul and the inner expressions of the individual artist. 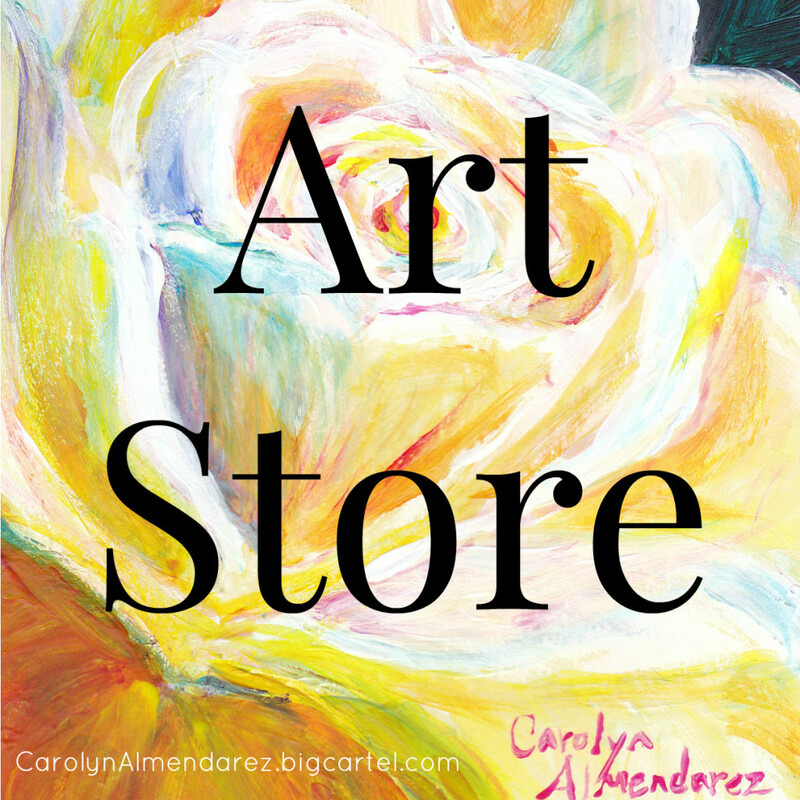 Summer Rose acrylic painting by Carolyn Almendarez. 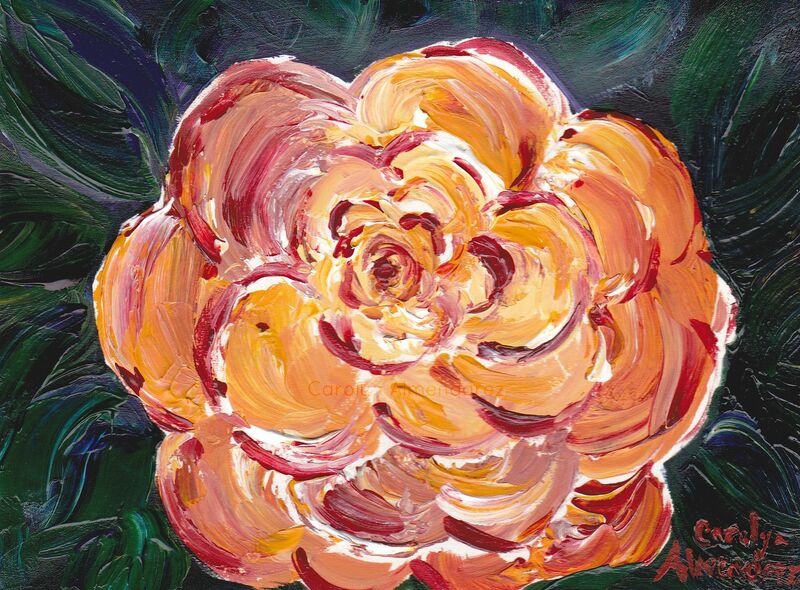 Acrylic painting of a summer rose reflecting the warm colors of summer. With this painting I layered multiple colors of paint on my brush before painting the petals and leaves of this summer rose. The effect gave an interesting blend of colors and textures. One of my favorite aspects of acrylic paint is the texturing effects you can create giving the painting a 3-dimensional feel unlike any other medium. Thank you for your patience as I have taken time off from my business and websites. I was feeling overwhelmed and overloaded trying to implement all of the marketing advice so I decided to take a break and figure out what I really wanted. I was feeling busy, but nonproductive. I wanted to make a difference in people’s lives, not just add to the noise on the internet. Being an avid learner and thinker I have a tendency to over complicate things and soon found myself in analysis paralysis, and everything came to a screeching halt. I’m a strong believer in keeping things simple. So I took the advice I so often give my clients and shut out the outside noises and spent time going deep within myself for answers and direction. Spending time in silence and writing down my thoughts and feelings, I repeatedly asked myself, “What do I enjoy?”, “How do I want to spend my time?”, and “What fulfills me?” All the noise simplified to three simple things: I enjoy writing, painting, and making a difference in the world. Everything else is just noise and complications. I will be ending all of my current mailing lists and invite you to opt-in to the new mailing lists that suite your interests. I want to keep things simple while making a difference in your life. I welcome any feedback, questions, or topic requests. In the upcoming year I have planned many new “Love, Life, and Health” related articles, nature inspired paintings, the publication of two new books and more in the works. 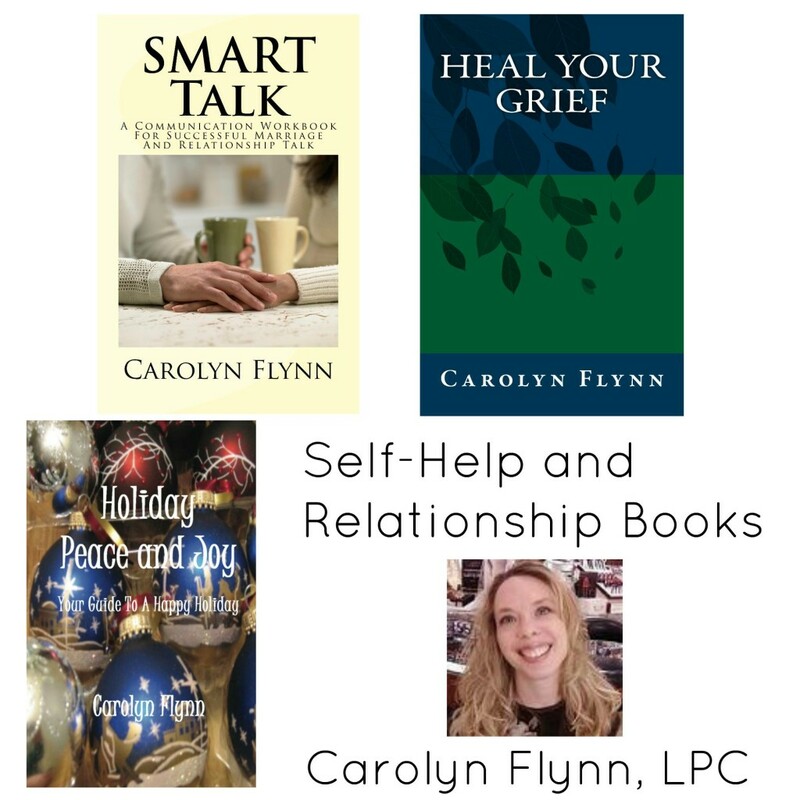 My new books “Weight Loss Solutions” and “SMART Relationship Communication” will be published in 2016. Friends and family on my mailing lists will be invited to get the books for free. Next week you’ll receive “Five Tips for a Stress-Free Holiday”. I appreciate your patience as I have taken time off for myself. I look forward to providing you with a host of helpful insights and inspiration to make your love, life, and health the best it can be.